Read on for why these were important. Today was Mother’s funeral service. The first floor of the church was quite full, and I was touched to speak with so many people who had had such wonderful memories of and interactions with Mother. We were all especially grateful that the full-size church choir was present to sing, and that the preacher, who both Mother and Daddy loved, ran the service so well. Mother used to tell the story of the brief period of her early childhood when her family lived in *******, Pennsylvania. When she’d awaken from her afternoon nap, her mother would put her in a fresh playdress and send her out to play with the other neighborhood children. There was a sloping alley down to a back yard where the children played, and Mother would recall standing at the top, stretching her arms wide and saying “Here’s me!” before running down to join the others. I love that story about her, because she retained that childlike openness throughout her life. Her big memorable smile and her many good deeds were always just out in the open, as simple as sunshine. She always retained a childlike sense of wonder, too. Anything and everything could be a source of absorbing interest to her - which could be a problem on family vacations. Given any set of exhibits labeled A through Z, in the same amount of time, my sister would be at Y, I would be at R, Daddy would be at G, and Mother would be at B. We stayed with their high school friend B**** S**** on a 1980 vacation in Washington, DC. When we visited the National Gallery of Art, he observed to me “I just rushed through all those boring Madonnas, but she was absorbed by every detail.” The week before she died, Mother and her dear friend L***** M*** went out to a restaurant for lunch, and unfortunately L***** got lost on the way. Mother, fascinated by the passing view, said only “Wow, I’ve never been through this part of town before!” This is all the more notable since Mother first arrived in Lake Charles in 1944, a Yankee from Wisconsin by way of New Jersey. Some of you here knew both Mother and Daddy from Lake Charles High Class of 1947, and Mother would tell stories sometime about trying to fit in at the beginning. One day she overheard a girl say that she needed to go get some Fem. “What’s Fem?” Mother asked, thinking it was some special product for girls. “You know,” the girl answered, “fi’m, for a camera!” Perhaps that incident started Mother acclimating to the South by taking on a Southern accent. Certainly by the time I was born she talked like a native. In later life Mother and Daddy were both involved in Class of 1947 reunions and get-togethers. They loved their class and their classmates. From Lake Charles High Mother went to LSU, where she loved being a Pi Phi and majored in math and music. Mother and Daddy’s friend D*** S***** responded to news of Mother’s death with this memory: "I always thought JoAnn was the prettiest girl at LSU and actually became associated with her before meeting your father. I had a beginning geology class with her, and she always set the curve, sometimes making a perfect score. She was one of the few females in the class, and her good grades did not go over well with the males.” Having met a lot of women who went through MIT in those years, too, I think it’s wonderful how attitudes about education for women have evolved in the last 75 years. Mother met Daddy at Lake Charles High, in the best all-American traditional way, on a blind date set up by Mother’s friend Billie Goux. Nine years later Daddy made her a part of First Methodist when they married at this altar in 1955. Mother loved being part of First Methodist Church. In the last few years she loved sharing her “six word life story:” “Lost. Found. Saved by church family.” It meant the world for her to be here, for the joy she found, and for the joy she spread. She always wanted to be active of the life of the church, too. Not long ago Mother told me there was a calendar of service opportunities out for members of the church to volunteer. She was maybe starting to feel like she should get busy and sign up for something to do some good . 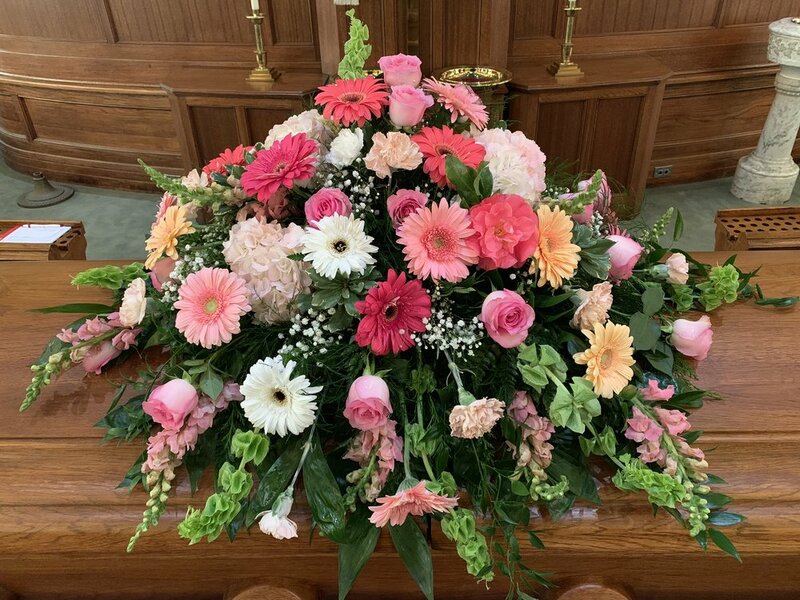 . . until a friend said something along the lines of, “JoAnn, I think you’ve already done plenty for First Methodist.” And when you think about it, she did an AWFUL lot. Mother was a creator, and we saw her create many things, from clothes to burlap flowers and decoupaged items to china painting to running the church craft fair for many many years. Perhaps her greatest achievement was the papier mache Mad Hatter’s hat she made for me to wear in a local production of Alice in Wonderland. When the director said “And then I want a cuckoo bird to pop out of the top,” I think she nearly threw in the towel. BUT SHE DID IT - she found a way for a cuckoo bird to come out of the top! - and I think in some ways it was her proudest craft achievement. She could take simple assignments and make something beautiful out of them. At one time during my childhood she was given the task of arranging the altar in their Sunday School classroom. This coincided with the camellias blooming, so rather than simply trot out a cross and an altar cloth, Mother harvested batches of blossoms to lay out in carefully considered patterns. I remember how grateful all the ladies were to take a camellia home with them. And what a good cook! Did you ever get to eat my mother’s cookin’? I was shocked when I got to college and learned that everyone did not grow up with a mother who was a good cook. And many people here received during some difficulty or other a big batch of her beef barley vegetable soup. All of us know what a good wife she was to our Daddy, Bill, especially in his last years. A long time ago I found a quote from President Grant’s funeral which, to me, perfectly summed up their marriage: “Husband and wife, the happy supplement of each other . . . He the Doric column to sustain; she the Corinthian column to beautify. He the oak to support; she the ivy to entwine . . . She shared his trials and his triumphs, his sorrows and his joys, his toils and his rewards.” Though in later years their roles reversed, and Mother became the oak to support Daddy’s entwining ivy. And she did it with enormous strength and patience and courage. She loved children in general, and she loved her grandchildren. Any interaction with Stephen, Evan, and Megan brightened her day. They all made a difference to her in their own ways. In the 1970s Mother had a personal epiphany that led her to recognize herself as a sinner and to stop trying to be a perfectionist. This was when “Pobody’s Nerfect” became her motto, and she had a bookmark - with a tassel in a deliberately wrong place - with that motto on it over her desk throughout her life. Pobody’s Nerfect. That said, she didn’t stop trying to be a better person. Mother always had a problem with timeliness - one result of which is that I am early to everything - and she sometimes she joked about being “the late Mrs. Dimmick.” Until just a few months ago, when a kind friend finally whispered in her ear “You know it’s not funny, right?” And Mother, chastened, started making a new effort to show up on time and not keep everyone waiting. Her ongoing fascination with her junk mail was very much in the same vein. But Mother had another little sign above her desk in the kitchen. This one read “Please be patient. God isn’t finished with me yet.” Well, I guess he found there were no more improvements to make. Lovely in her life, now she makes Heaven lovelier. One blossom is a camellia from Mother’s front yard.